WHAT: At a public meeting, the Court Facilities Advisory Committee will review a subcommittee directive regarding the acquisition of a site for the new Modesto courthouse in Stanislaus County. The agenda for the meeting is posted on the advisory committee’s web page. The advisory committee invites the public to submit written comment in advance of the meeting or to request time to speak during the meeting’s comment period. Details are noted below. 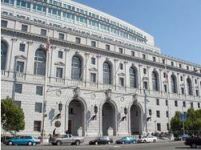 WHEN: Wednesday, March 12; 10:00 a.m. to 11:30 a.m.
WHERE: Judicial Council Conference Center, Hiram Johnson State Office Building, Third Floor, Ronald M. George State Office Complex, 455 Golden Gate Avenue in San Francisco. WHO and WHY: The Court Facilities Advisory Committee (roster) was appointed in 2011 by Chief Justice Tani G. Cantil-Sakauye. The committee makes recommendations to the Judicial Council concerning the judicial branch capital program for the trial and appellate courts throughout the state. Speaker’s email address, telephone number, and mailing address. For planning purposes, the committee asks to receive requests to speak at the meeting by 4 p.m., Tuesday, March 11. Speakers will be scheduled in order of requests received. Depending on the number of requests, speakers may be time-limited at the discretion of the committee chair. The chair may waive advance-notice requirements to speak if time allows.